And the flippers are in. Who wouldn't want that in the front room? 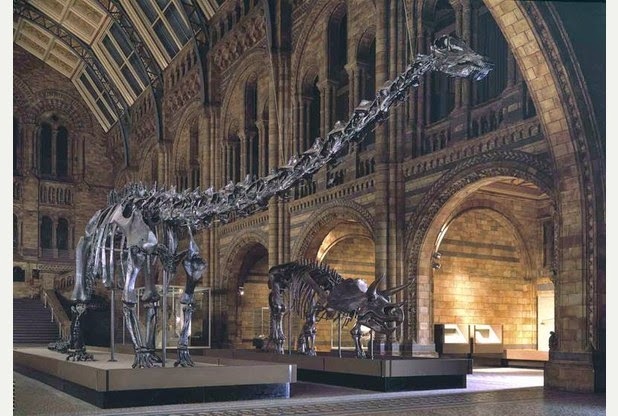 The Natural History Museum has just announced that Dippy is being retired. The rather splendid cast of diplodocus is being removed and being replaced by the skeleton of the blue whale. But not after a fight. 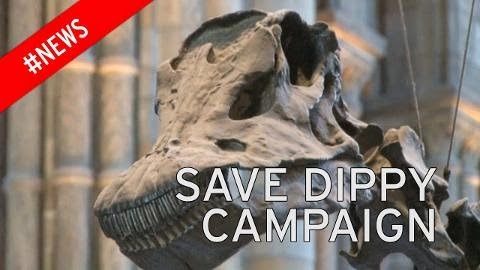 Some of us it seems, are rather fond of Dippy and are not going to let him go without a fight. The plaster cast skeleton was a gift to the Museum from Andrew Carnegie (from Val McDermid and Ian Rankin country in the kingdom, of Fife) and he bears the name Diplodocuscarnegii for that reason. 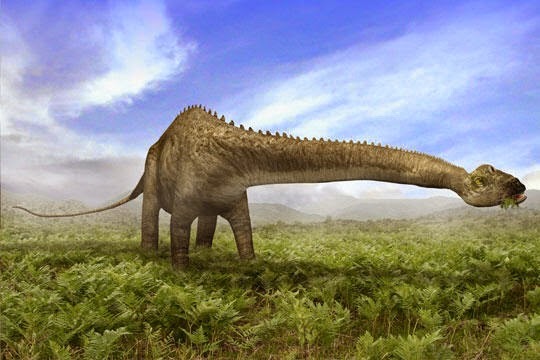 At that time, 1905, he was the largest dinosaur known. 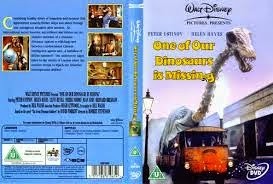 Although there are other copies of Dippy... Dippy doubles…10 of them, decituplets? something… in Berlin, Paris and Milan, he is always associated with the Natural History Museum in London. He has taken pride of place in the main hall since 1979 and he reflects the beautiful architecture around him. He seems to fit in a way that I’m not a blue whale would. 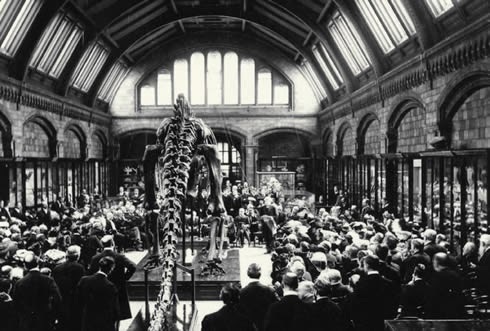 Rumours are now abounding that the Museum have ill judged the denizens depth of devotion to Dippy. but Dippy is engaging, and he talks to the young. There is a sense of evolution when you talk to Dippy. Dippy discourse. Of course. 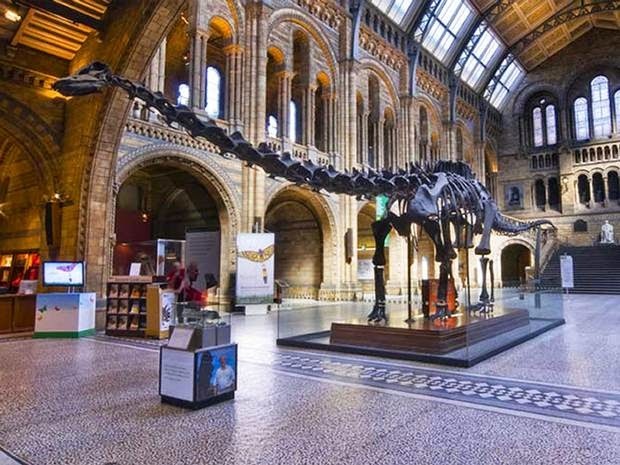 Over the last few years Dippy has raised nearly a million pounds in funds and the dinosaur exhibits that he heralds is the only one that always has a queue to get in. On our recent visit we saw the sign that said an hour to queue from here. And that was a school day, early Friday morning. Instead we watched homo sapiens fall over on the ice rink, where the sun had melted the top inch of the surface so there was a lot of water sloshing about. Anybody who fell got very wet. Especially on their backside. 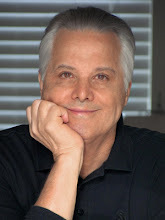 Homo sapiens soakius gluteus. 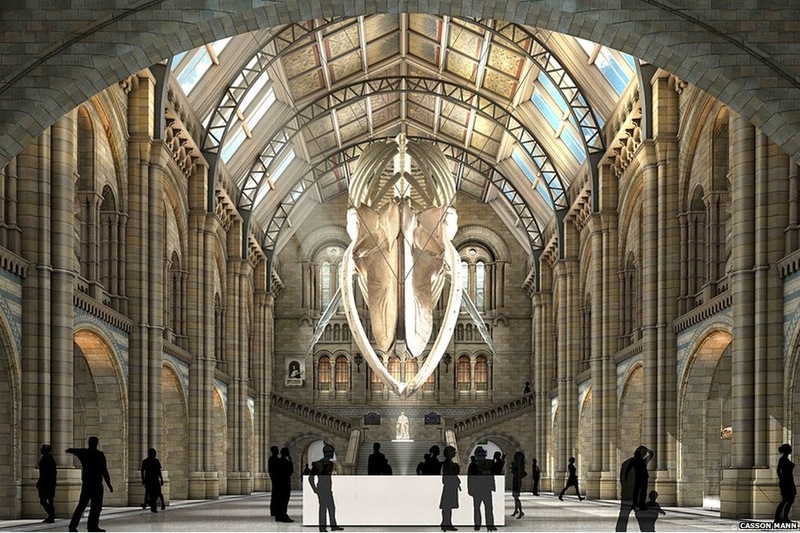 So what is going to happen to Dippy's remains. Maybe he will be kidnapped for his own good, as in One of our dinosaurs is missing. But he is a senior citizen, a golden oldie, a crumbly or as we call them in Glasgow, a coffin dodger. He is over a hundred years old, he is fragile and delicate. Decorously Delicate Dippy. So touring seems out the question. He could be set free and put outside to graze on the grass at the front of the museum but he would need to be recast to withstand the weather and therefore he would not be not Dippy the delectable. The thought of him being wrapped up and put in a box with a bar code on top is dastardly and deplorable. 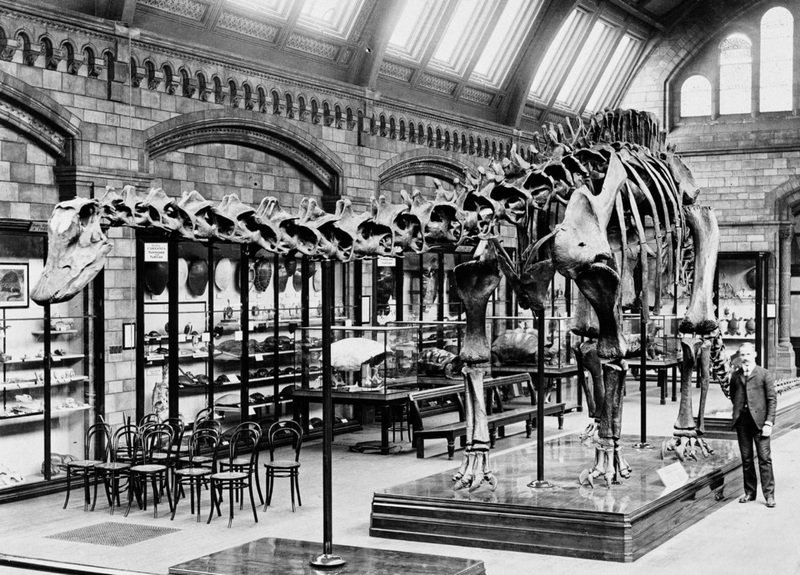 He has 292 bones, 36 packing cases brought him to London, it took four months to build him and he was unveiled on Friday 12th May 1905. He was taken down during the war to protect him and over the years he has been re configured as paleontologists advanced research and understood more of how Dippy would look and how he would move. Originally his tail and head were down, now the neck is horizontal and the tail forms a graceful arc over the heads of his visitors. As I said there is now a petition. 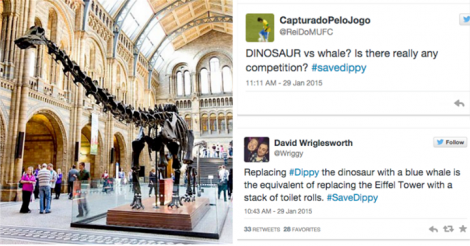 it attracted 22,574 signatures in just one day and novelty pop duo Right Said Fred have released a single to help prevent Dippy’s demise. Their hit song was called deeply dippy so it's not a huge lyrical leap. 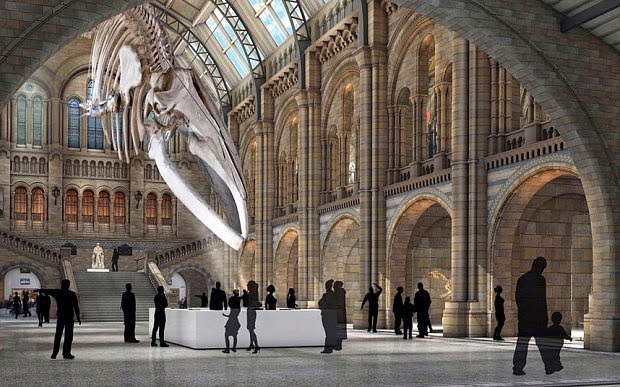 The lower comment says that replacing Dippy with a blue whale is like replacing the Eiffel Tower with a stack of toilet rolls. The director of the zoo says that he loves Dippy, too but the dinosaur has had a good 35 years in the limelight and he is ready for something new. I've known men to use that theory about their wife. Yes, but how many men have had 35 good years of their wife AND called her Dippy for most of it...? The majority of them would not have survived though EvKa! Couldn't they put them side by side? I've known men to try that too, but it didn't work out so well as all parties were still alive. 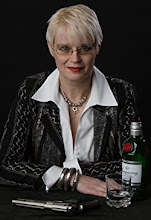 This is an answer ignoring your obvious baiting final line, Ms. Ramsay...it being so close to Valentine's Day and all. Besides, we Pittsburgh boys were raised better than that...Andy Carnegie and I, that is. Did you know that the Carnegie Museum of Natural History in Pittsburgh has one of the "best" collections of dinosaurs anywhere? 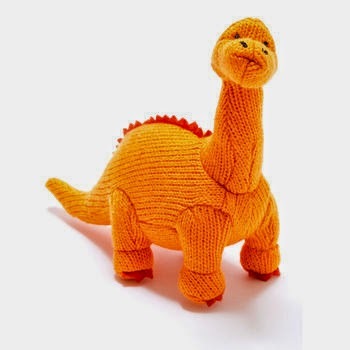 Including a Diplododocus carnegii! As a child, and indeed as an adult (?) I stood beneath it's legendary Tyrannosaurus Rex and stared in awe. Hmm, I wonder if that subconsciously influenced my decision to become a lawyer? Only the Steelers announcing they were moving out of Pittsburgh would likely strike Pittsburgh school children as a bigger loss. I'm with you in solidarity, sister! Dippy rules!